Welcome to the nineteenth issue. It highlights a best-selling author's writing life, numerous writing articles and some new links to check. This publication appears monthly. If you are reading this issue forwarded from someone, be sure and use the link below to get your own free subscription. With the last few issues, I've received several readers calling to my attention that only part of their newsletter arrived. Maybe an article started then it was abruptly cut off without completion. Or maybe you didn't receive Right Writng News Issue #18 (sent May 19, 2005). Issue #18 contained a great deal of rich how-to writing material and was about 23 pages long when I printed it. Some of you noticed that you missed an April issue. With my travel schedule and other factors for the month, it was impossible to get that issue out to you. So....this issue #19 following almost on the heels of #18 will help make up the difference. I've put together a shorter issue yet packed with quality how-to material. If part of your issue is missing, I suggest you go to the back issues link or http://snipurl.com/rwnback. You received this link with your initial welcome letter to the Right Writing News. Please take this back issues link and save it into the favorites in your browser. It will help you return periodically and gain all of this valuable writer information. If for some reason, you haven't received an issue in some time, then return with the back issues link. Enjoy this issue. I'm always looking for quality how-to writing articles to use in this newsletter or on the Right-Writing website. W. Terry Whalin understands both sides of the editorial desk--as an editor and a writer. He worked as a magazine editor for Decision and In Other Words. His magazine articles have appeared in more than 50 publications including Writer's Digest and Christianity Today. Terry has written more than 60 nonfiction books and his latest is Running On Ice (New Hope Publishers). His book for writers has just released called Book Proposals That $ell, 21 Secrets To Speed Your Success (Write Now Publications). Find out more at: www.bookproposals.ws See more about his writing at www.right-writing.com/whalin.html. He is the Fiction Acquisitions Editor for Howard Publishing. Terry and his wife, Christine, live in Scottsdale, Arizona. W. Terry Whalin has written more than 60 nonfiction books and has also worked as an acquisitions editor for Cook Communications and Howard Publishing. He is the creator of a website to encourage writers at: www.Right-Writing.com. A popular speaker at conferences, Terry and his wife, Christine, live in Scottsdale, Arizona. The new trade paperback book (with the retail price of $14) is available in many different places. As Senior Editor at Multnomah Publishers Larry Libby says, "In the often bewildering world of book publishing, aspiring authors need more than desire, creative skill, and something worthwhile to say. They also need a road map. My friend Terry Whalin offers a map even Rand-McNally couldn’t top. If you have any inclination toward getting a book published, you’ll do well by studying this book first." 2. Order a copy from Amazon.com -- make sure you check out the reviews. 3. Order a copy from Barnes & Nobles.com -- make sure you check out the reviews. 5. Order a copy at Christian books.com -- again this site has reviews of the book. 6. Order a copy from your local bookstore--and remember to take along the ISBN or the International Standard Book Number (1-932124-64-0) so your local bookstore can look up the book from FaithWorks Distributors and order it. 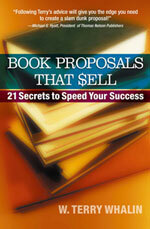 Actually there are more than seven ways to get Book Proposals That Sell, 21 Secrets To Speed Your Success. If you want the book immediately in electronic form (you print your own book), then go to: this link. Guy gets the girl. The murder is solved. Girl gets other guy. The world is rescued from the bad guy. Girl loses guy. The farm is saved. Justice prevails. Earthlings survive attack from outer space. Problems are cleaned up -- or not. Loose ends are knotted, snipped -- or not. But -- like a lot of the stuff of good storytelling, it's not that easy to do it well, to pull it off so that your audience says a collective "Wow!" The zinger, the twist, the topper they didn't quite expect. You know the kind -- those delicious finishes you've encountered in your favorite novels, stories, movies. As with memorable openings, satisfying, drop-dead endings can be elusive, difficult to create. But they're worth the striving. In the action genre, whether TV, movies or novels, the end scene is often -- and appropriately -- described as the blowoff. A good way -- for the writer's head -- to regard the finish of even the most benign type of story. How many times have we read novels where the last three or four pages were coda, where the whole thing just wound itself down, rather than presenting anything new --anything unanticipated? Satisfying, maybe. Blah, more likely. Like certain symphonic pieces that seem to end, but no, there's more -- and then more. And movies? A notable example was a rather pleasant Bette Midler vehicle, Beaches, (Scr. Mary Agnes Donoghue, from Iris Rainer Dart's novel -- Dir. Garry Marshall) which seemed to have three or four endings. They'd play a "final" scene, at the conclusion of which the audience expected to see the end-credits. Instead, another scene was played, and then another. Looked at another way, I suppose it can be argued that they were giving us their own brand of surprise, but I'm not sure that that was the filmmakers' intent. Again using action films as a model, think of it as the challenge of coming up with a blowoff that tops all of the movie's earlier fireworks and razzle-dazzle sequences. A superb example of a film that accomplished this at the end of an already breathless, seamless, relentlessly paced story that was full of Big Moments including the all-but-impossible-to-surpass railroad locomotive/prison bus collision), the finale of The Fugitive manages to leave the viewer exhausted and gratified. But helicopters, explosions and shootouts atop tall buildings aren't a requirement. A much quieter though no less satisfying finish occurs in one of the best films ever made -- the great, enduring Casablanca. Rick and Ilsa's final goodbye was -- and still is -- flawless, almost unsurpassable, speaking to all but the most cynical among us, about sacrifice and lost love. But the film couldn't end there. We had to see the plane taking off for Lisbon, as well as resolving Rick's having shot the German Officer, Major Strasser. And ironically, the final, unforgettable line of dialogue -- "Louie, I think this is the beginning of a beautiful friendship." -- wasn't even in the script. It was tacked on during the editing process. Now -- going for this type of ending seems on the face of it to be an obvious goal. And of course, from page one, you've been trying to give them stuff they don't expect. But the most important one you're going to write is the one that resonates after the reader finishes your book, or your viewer turns off the TV or exits the theater. Sometimes it's big without being slam-bang -- a moral, a comment about life, or the world.Often it's something small -- smaller perhaps than the goal just achieved by your protagonist. A feelgood moment -- or one that's eerily ironic. Or humorous. Or full of portent. Again, the key is that it should seem unexpected -- yet satisfyingly inevitable. It should feel right. Always, when you devise your endings, your story's final moments, your curtain-line -- try to surprise. I'm not talking off-the-wall, come-from-nowhere, nonsense endings. I mean an end-frame that's legitimate, organic to your story, that comes from deep within your construct, or your characters -- one that seems right -- and causes the audience to -- if not gasp -- perhaps think about. A Curtain that stays with us. One of my favorites is the final moment, the last line of dialogue in Three Days of the Condor. Aside from its superb execution, it struck a chilling note back in 1972. Seen today, in the context of what we now know, it's spookily prophetic. A few other killer endings: Steinbeck's The Grapes of Wrath, and John O'Hara's novella, Natica Jackson. Both will remain with you for a long time. As will the final, devastating shot in the wonderful, funny/painful film, The Heartbreak Kid (Scr. Neil Simon, based on a story by Bruce Jay Friedman -- Dir. Elaine May). There are of course many others, and you probably have some favorites of your own. Study them. Figure out what makes them work. And then steal from them. Admittedly, by the time we've completed our outline we may not always have found that stick-to-the-ribs, unexpected ending -- the superbly orchestrated blowoff. Oh, we should be more-or-less there, have an idea of how it's going to end, but -- things occur to us as we write -- it's part of the process -- and when it's working, when we let art happen, one of the fun parts. But certainly by the time you reach the end of your story there should be that turn, that switchback (or maybe several) that maybe even you -- weren't anticipating. I didn't find the closing lines for my novel, The Sixteenth Man, until after I had finished what I assumed was my final draft. As with so many of the discoveries we make while in process, that one hit at about 4:30 AM, jolting me out of heavy sleep. Children's book authors who bring animals - pets, pictures or stuffed - to book signings usually sell lots of books – and have fun too! "I did two readings for B&N," says Anita Salzberg, author of three children's books on animals and an adult book about her life with her husband, the turtle lover. "The first was an early afternoon talk on Turtles (Franklin Watts 1996), my children's book written with my husband Allen. B&N promoted the reading and the fact that we'd be bringing turtles. A crowd of 50 showed up--parents, children (mostly under 5), and as many of the store staff as could get away from their posts. "The store had ordered 25 books (softcover, $7). We sold 10 that afternoon. The Events Coordinator explained that people would return later and buy more books. People did. The store reordered 25 copies the next week. Okay, our sales were not on a par with John Grisham's, but we did way better than the 5-7 copies I know to be standard for book readings/signings by unknown authors. "About a week later, I gave an evening reading at that same B&N of Confessions of a Turtle Wife (Bookpublisher.com 2001). Again, the promotional materials stated that we'd be bringing live animals." "If you're promoting a book about animals or about people and animals, bring the animals! Anita suggests. "As an unknown author, you may or may not draw a crowd. But your animals sure will. "The corollary to this suggestion is: at your reading/presentation, bring out the animals last. Otherwise, you will be upstaged! No one wants to listen to you talk about your book when they can ooh and ah over a turtle that reminds them of the one they had as a child. When her 25th book, My Little Book of River Otters (Windward Publishing 2003), was published, Hope Marston had a cake made to order with the otters from the book jacket on it. "We had over 100 people, more than the room could hold safely, and I sold lots of books and stuffed animals that go with all six books in the series," she says. Hope attributes the large turnout to the fact that she brought along her illustrator, whose drawing of an otter was used as a door prize. © 2005 Francine Silverman. Used with Permission. Often in my various entries about The Writing Life, I've discussed the immense benefits of attending a writer's conference. It's a great place to learn about the craft of writing, gain some encouragement from other writers as well as begin to make some solid relationships with different editors and literary agents. I regularly teach at writer's conferences as well as invest to attend different writer's conferences. I understand and appreciate the value in each one conference. While there are many advantages to a writer's conference, there is also a cost in terms of time and expense. To attend most of the major writers conferences it's easy for someone to spend $1,000 when you add the airfare, conference costs and other expenses. Is there another alternative? One alternative is a product I've seen called Everything You Need to Know to Become A Best-selling Author, Lessons from an Anonymous Publishing Giant by Scott Jeffrey with Dr. X. It's loaded with information from an experienced author who can't reveal his identity because of his intimate relationship with a large publishing company. You may wonder about this Dr. X and whether he knows his "stuff." The back of the product provides some additonal background. "Dr. X" operates one of the ten largest publishing companies in the United States. Starting in publishing 25 yers ago, Dr. X has worked in every major facet of the business. He also ran a successful literary agency for eight years and has written two New York Times bestsellers. Follow the link to get the complete information about this package but it has over 7 1/2 hours of recorded conversations with someone who knows the inside scoop about publishing because he has spent years in the trenches of publishing. Because you purchase the audio CDs, you can repeatedly listen to the information and I believe each time you will pick up a new aspect about this business. It's not easy for anyone to be published and you have to learn the system. This innovative package teaches you a different means to learn about publishing in the comfort of your own home or car. It's a solid alternative to attending a writer's conference and something worthy of your serious consideration. W. Terry Whalin understands both sides of the editorial desk--as an editor and a writer. He worked as a magazine editor for Decision and In Other Words. His magazine articles have appeared in more than 50 publications including Writer's Digest and Christianity Today. Terry has written more than 60 nonfiction books and his book for writers has just released called Book Proposals That $ell, 21 Secrets To Speed Your Success (Write Now Publications). Find out more at: www.bookproposals.ws See more about his writing at www.right-writing.com/whalin.html. He is the Fiction Acquisitions Editor for Howard Publishing. Terry and his wife, Christine, live in Scottsdale, Arizona. Boost Your Creativity--by Giving Procrastination the Boot! As I sipped my morning tea and lingered over the newspaper one Monday morning the phone rang. I recognized my friend Angela's voice immediately. "Hi Karen. Guess what? There's a class on wildflower identification starting next week at the Community Center. Six weeks, one night a week, and two field trips to the desert. Isn't that fabulous? I want us to go together." "Gosh, Angela," I said as my mind raced ahead, "I'd like to but I can't spare that much time away from my writing. I have four articles due by the end of the month and I'm putting a book proposal together." "I had a feeling you'd put your writing first," she said. I could hear the disappointment in her voice. "It's okay, I understand." Then at the last moment, she added, "I wish I had your discipline. I wonder if I'll ever get to my writing...." She laughed nervously. "I seem to have a case of terminal procrastination." There was that word again--procrastination. I had just spent more than an hour in one of my recent writing classes addressing that very topic. The students ranged in age from twenty-something to seventy-something and had a variety of professional and life experiences. But following our introductions at the beginning of class, we soon noticed that everyone in the room had two things in common: a desire to write and some resistance to actually doing it. They continually put off doing what they claimed they really wanted to do. Write. Like my friend Angela, their creativity suffered because they gave in to procrastination. Several students shared their frustrations. Then I suggested the possibility that "what we call procrastination may be just an excuse we use to avoid doing things that we feel powerless over." I asked the students to list activities they feel passionate about, things over which they feel powerful, and ways in which they are productive. I recited a few examples: tinkering with cars, playing with one's grandchildren (that's high on my list!) and building model airplaines. Suddenly heads went down and pens flew across the pages. Five minutes later we compared lists. The interests and activities ranged from bridge to baking, from golf to gardening, from chess to church work, from skiing to sailing, from cooking classes to computer games. Several men and women admitted to investing hundreds of hours a year and thousands of dollars in their hobbies. "I love sailing," said a gentleman in the front row. "I could stay on my boat all weekend. It's my thing," he said. "Bridge stimulates my mind," said an older soft-spoken woman in the back of the room. "I'm good at what I do," said another, referring to his bread-making hobby. "It's a way to meet people," added one man, speaking of his interest in dog shows. The comments continued. In moments we had a consensus. When we do something we're passionate about--something that gives us a sense of power, procrastination is not an issue. We feel creative! "You mean I might actually get going if I pick something I really like and begin writing about it?" asked George, a retired man who spent hours on the golf course. "Absolutely," I said. "Make a list of the things you like best about golf. How it's changed your life, tips you've acquired over the years to help beginners, perhaps something on the history of the sport...and so on." By then George was grinning and taking notes--with passion. Students began encouraging one another to put their hobby, pastime, interest, and expertise to work for them. And you can do the same. For example, if you enjoy music, write about it. Develop a specialty that will land sales to publications that specialize in topics related to music. If you're into computers or bridge or cooking or health care, learn more, interview the experts, query the appropriate magazines and get started writing in those fields. As your passions are ignited, that same flame will light your personal power. You'll have something to say that is worth saying--and hearing. And the more you are heard and respected and acknowledged for your expertise, the more productive you will become. So there you have it. Passion. Power. Productivity. Here's how it works for me and how it can work for you too. What am I excited about? What interests me? What can I stay with long enough to sustain the completion of an article, story, or book? These are the questions I ask myself every couple of years. As I change and grow as a person, my writing interests change and grow, as well. For the first fifteen years of my career, for example, I wrote books on animals, science, special effects in films, natural disasters, animal rights, the environment, and homelessness--all subjects I had strong feelings about. I didn't mind the long hours of research and interviewing, or the fifty-some newspaper articles I had to read on microfilm. When I think of it now it sounds daunting. But that's because I am no longer passionate about these topics. And that's an important distinction between then and now. I didn't mind the work then because those subjects were of interest to me at that time. Today I am on to other things: grandparenting, literacy, intimacy in relationships, women and money, personal development. I have written books on all these topics in the last five years and I never once procrastinated because I loved what I was writing about. On the other hand when I think of writing a book today on birds or horses or careers in the zoo (all of which I wrote about during the past twenty years) I realize I can't do it. I simply don't have the drive--or the passion--to take on such a project. What valuable information that is. I now know what to say yes to and what to say no to--because I know my passions. You have the same emotional tone scale available to you. Look within at what you really want to write about. Forget about what's 'in' or 'hot' or trendy. If your heart's not in it, chances are you will never write it and your creativity will take a dive. My entire writing career transformed when I took seriously the meaning of the word power. "Strength. Might. The ability to do or act…" (The World Book Dictionary) When I wrote with passion, I felt strong and resilient. I had the ability to do what needed to be done. I could meet deadlines. I could work with editors. I could make requested changes without feeling judged or criticized. I was writing on topics I knew and cared about. Therefore, I was not easily shaken or side-tracked. I was able to encourage and reward myself when I accomplished a goal. I had no desire to put off till tomorrow what I could do today. I wanted to write today and the next day and the next because I was empowered by my passions. For example, for five years I nurtured an idea for a book on how parents of grown children could restore broken relationships with their adult sons and daughters. Then when I experienced a break in my relationship with one of my children, my passion for the subject reached a new level. I had to write that book. It sold to Thomas Nelson Publishers and was published in 1993. Once I started the book I never looked back. My passion for the topic strengthened me. Even the interviews came easily. Power fueled by passion results in productivity. Once you are clear about your interests and your strengths, you will be eager to get to your keyboard to share what you know about the subject. You'll be able to set goals that at one time might have sounded impossible, even overwhelming, but now seem not only possible, but plausible. You know you have something worthwhile to say and you're eager to say it. That determination will also help you create a productive work schedule--one that is realistic and appropriate for your life-style. When I began writing in the middle seventies, for example, I had three children under age twelve. My best efforts yielded only one article or story per month. But that was fine with me. At least I had made a start. I had plenty of years ahead to develop myself as a writer. Today, however, my children have families of their own and I am alone in my home office all day. Such freedom allows me to turn out two or more books a year, and several articles a month in addition to part-time teaching. What was productive twenty years ago would be loafing today. What I do today, however, was not possible twenty years ago. I started with that first step. You can too. So boost your creativity by giving procrastination the boot! Let your heart have its way. Write what you love (and write it well) and the money, byline, and recognition will follow. Karen O'Connor is a sought-after speaker and award-winning author of more than 45 books for adults and children, including the best-selling Help, Lord! I'm Having a Senior Moment (Regal Books), Getting Old Ain't For Wimps, (Harvest House) and In Step With Your Step-children (Beacon Hill). She is a wife, mother, grandmother and writing mentor for the Long Ridge Writers Group (www.longridgewritersgroup.com) and for the Christian Writers Guild (www.christianwritersguild.com). Karen is known for her wit and wisdom on the platform and in print. Visit Karen on her web site for more information: www.karenoconnor.com. © 2005 Karen O'Connor. All Rights Reserved. Used with Permission.